In developed countries, between 10 and 20% of the population suffers from Irritable Bowel Syndrome or Chronic Constipation (1, 2). The treatment of these conditions is complex and, as yet, little money has been spent on research. It is a complex clinical syndrome in which multiple factors, endogenous and exogenous, can alter the course of the disease. Moreover, the body's homeostatic mechanisms counteract the action of drugs usually recommended for this pathology, making them relatively ineffective. Various substances, with specific actions on various types of receptors have been studied: Tegaserod (3, 4) and Renzapride (5, 6) (5-HT4 receptor partial agonists), Asimadoline (7, 8) (ĸ opioid receptor agonist), Alvimopan (μ-opioid receptor agonist) and Lubiprostone (9.10) (interacts with receptors that regulate chloride anion channels) (11, 12). Of all the aforementioned substances, Tegaserod has been marketed for constipation associated with Irritable Bowel Syndrome (in women), and Chronic Idiopathic Constipation (in men and women) (12). More recently, Lubiprostone has been approved for Chronic Idiopathic Constipation (men and women) (12), currently undergoing clinical trial for its potential indication for constipation associated with Irritable Bowel Syndrome (12). Irrespective of clinical experience and the results of ongoing clinical trials, these drugs show little efficacy against results observed in placebo groups. The first conclusion is that these disease entities are far from obtaining a satisfactory pharmacological resolution, and require new and effective treatments. Indeed, in 2007, the FDA (The Food and Drug Administration) required that Novartis AG (manufacturer of Tegaserod, under the names of Zelnorm ® and Zelmac ®) withdrew Tegaserod from the market due to the results of a retrospective analysis of 18,000 patients, in whom a slightly higher incidence of ischemic attacks (myocardial infarction, unstable angina, and stroke) was observed (13). Another drawback in this field was the break in phase III clinical studies, in 2007, concerning the ĸ-opioid receptor antagonist Alvimopan. In this case the disruption was a result of an increase, although not statistically significant, in arrhythmias, when Alvimopan was used for the treatment of bowel dysfunction caused by opioid treatment. The therapy for Chronic Idiopathic Constipation and constipation associated with Irritable Bowel Syndrome, have turned towards the stimulation of gastrointestinal motility, either directly, or by facilitating the movement of water into the intestinal lumen. Moreover, drugs currently available for these indications, lead to dehydration and electrolyte imbalance - systemic effects which further limit the low therapeutic efficacy of these drugs (14, 15). Enterocytes secrete guanylin and uroguanylin in the intestinal lumen in response to increased intraluminal concentration of Na +. Homology exists between the intestinal hormones, guanylin and uroguanylin, and heat-stable enterotoxins that cause diarrhea, both of which share identical mechanisms of action. Enterotoxins, as with both intestinal hormones uroguanylin and guanylin, bind to a protein "guanylate cyclase" which is embedded in the apical membrane of enterocytes. Enzyme activation "guanylate cyclase" gives rise, as inferred from the name of the enzyme, to the formation of "cyclic guanosine monophosphate" (cGMP) (16) through a signaling pathway that involves the formation of the "Cystic Fibrosis Transmembrane conductance Regulator" (designated by its acronym CFTR). Experimental studies on knockout mice depleted of the genes which encode the enzyme "guanylate cyclase" showed that they did not suffer from diarrhea after infection with Escherichia coli (Gram negative bacteria), which produces a thermo-stable enterotoxin, as opposed to other bacterial toxins, whose activity is mediated by the activation of the enzyme "guanylate cyclase" which triggers profuse diarrhea, as occurring after infection with Vibrio cholerae (17). The observation that peptides related to guanylate trigger chloride and bicarbonate secretion has brought about an attractive new line of research, under which Microbia Inc. has developed a cyclic peptide agonist of the enzyme "guanylate cyclase". This peptide is called Linaclotide (18). The first pre-clinical studies in animal models (rodents) report a favorable clinical outcome (19). Furthermore, other studies in animal models suggest that Linaclotide acts favorably upon visceral pain modulation (20, 21). Linaclotide is a cyclic peptide of 14 amino-acids, with three disulfide bonds (cystine bridges formed from two cysteine ​​amino-acids). From a molecular point of view, Linaclotide is an agonist of the enzyme "guanylate cyclase", with a subsequent synthesis of cGMP (cyclic-guanosine-monophosphate). In vitro, an increase in cGMP in enterocytes has been shown. In vivo (mice and rats), Linaclotide increased a secretion of fluid into the intestinal lumen, increasing motility, and decreasing visceral pain (19, 22, 23). Clinical trials to evaluate the pharmacodynamic effects of Linaclotide have been performed in two main directions: constipation associated with Irritable Bowel Syndrome, and Chronic Idiopathic Constipation (18). The manufacturer (MICROBIA Inc) plans to expand the potential therapeutic use of Linaclotide for two new indications: Paralytic Ileus and Constipation associated with Opioid-treatment (24). 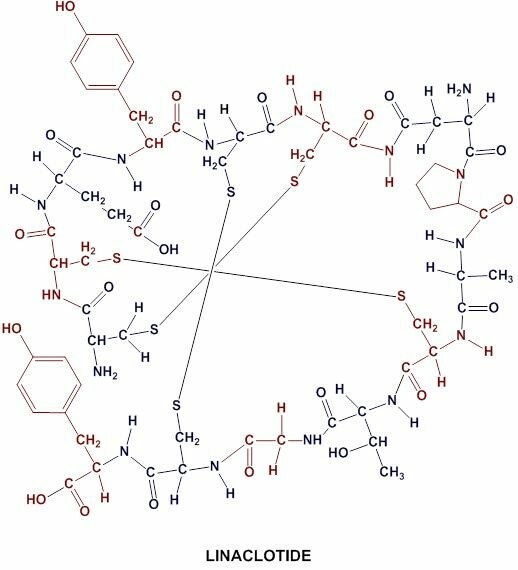 Linaclotide peptide has three disulfide bridges - between amino-acids 1 and 6, 2 and 10, and 5 and 13. These bridges between cysteine ​​amino-acids in a relatively distant primary structure (amino-acid sequence) stabilize the tertiary structure (Fig. 2). Linaclotide shares pharmacological activity on the gastrointestinal tract with uroguanilato and guanylate (25). The main complexity of the chemical synthesis of Linaclotide lies in obtaining the formation of correct disulfide bonds. More detailed information of their synthesis is described in patent WO-2004069165. Besides the above patent, Microbia Inc. has filed patents for other products for equivalent indications, EP-01594517 and US-20040266989. Available information is very limited. Until now, pharmacokinetics shows a linear relationship between the administered dose and pharmacodynamic activity in studies in both rats (20) and humans (26). To determine bioavailability, Linaclotide was administered, both per os and IV bolus, to male and female rats. Drug concentrations in the blood were determined by liquid chromatography and mass spectroscopy. It was well demonstrated that Linaclotide acts locally, with minimal absorption (approximately 0.11% at 6 hours after administration). Only one metabolite, designated as MM-419447 (27), was detected through radio-ligand techniques (in vitro assays) and in vivo experimental studies. Linaclotide causes increases in the concentration of cGMP (studies in human cancer cells T84), finding a relationship between the concentrations of MM-419447 and intracellular cGMP, at least in the range of 0.03 nM to 1.000nM. These studies demonstrated the binding of metabolite (MM-419447) with the enzyme "guanylate cyclase" on the apical membrane of the epithelial cells which line the colon. When Linaclotide was administered directly, almost the same effects were observed. The inference is that both compounds (Linaclotide and MM-419447) are lookalike drugs, or the metabolite is the active ingredient, being a pro-drug Linaclotide. Although both possibilities may be valid, one fact led us to consider the former option as the most feasible alternative: the lowest effective dose of the metabolite (MM-419447) was 6.25 mcg / kg, compared to 5.0 mcg / kg, with Linaclotide. Linaclotide metabolized to MM-419447 by carboxypeptidase enzymatic action. The metabolite is, however, highly resistant to proteolysis , at least under non-reducing conditions. When the metabolite (MM-419447) was administered, either per os or IV bolus, it became clear that absorption is very low, as observed with Linaclotide. In two phase Ia clinical studies (28, 29) Linaclotide, in a dose ranging from 30mcg q.d. to 3.000mcg q.d., was administered. Linaclotide was well tolerated, whatever dose was selected, and systemic absorption was minimal. Two randomized, double-blind, placebo-control group Phase Ib studies, with a dose escalation from 30mcg q.d. to 3,000mcg q.d,. were carried out on healthy men and post-menopausal women (30, 31). In the first study, the individuals included subjectively assessed the consistency of their bowel movements, according to the BSFS (acronym for Bristol Stool Form Scale). Decreased stool consistency was associated with a more rapid transit in the colon. Following the BSFS scale, the administration of Linaclotide caused the faeces to be less consistent (greater subjective BSFS score), while more plentiful (increased stool weight) (32). In the second study (phase Ib), 48 healthy volunteers received different daily doses of Linaclotide (30mcg, 100mcg, 300mcg, and 1.000mcg) or a placebo (control group) for 7 consecutive days. Tolerance was excellent throughout the whole range of the doses, and there was no systemic exposure to Linaclotide or its metabolite (MM-419447). The BSFS scale was used to assess faecal transit and the frequency of bowel movements, and the weight of faecal deposition improved with the higher of the doses (1,000mcg q.d.). A Phase IIa clinical trial was conducted, whose results were announced in October 2006 during the meeting of the American College of Gastroenterology Annual Scientific Meeting (32). During the 14 days of the study, 42 patients were given either a placebo (control group) or Linaclotide, employing one of the following management protocols: 100mcg q.d., 300mcg q.d., or 1,000mcg q.d. Linaclotide showed a superior efficacy to the placebo in all the parameters used for the evaluation of the results. This study was extended to another study (phase IIb) selecting a daily dose of 300mcg of Linaclotide (32). A randomized, double-blind phase IIb clinical trial (number: 36), including a control group (placebo), studied the effect of Linaclotide on patients with constipation associated with Irritable Bowel Syndrome. The endpoints were the "gastrointestinal function" and "colon function" (33). After five days without treatment, "oral-cecal function" was assessed. Patients were divided into three groups: (1st) placebo, (2nd) Linaclotide 100mcg q.d., and (3rd) Linaclotide 1,000mcg q.d. The "colon function" was determined as a mixed parameter that included scintography and the BSFC (Bristol Stool Form Scale). No delay in gastric emptying time or "oral cecal transit" was observed, but there was an increase in colonic transit when the higher dose of Linaclotide (1,000mcg q.d.) was administered. Stool frequency increased statistically significantly (p <0.001), a result concordant with other observed effects. Likewise, the consistency of the faeces showed a high correlation with the dose administered. Phase III clinical trials (36) confirmed the results of the phase II studies discussed under the previous heading. So far, Linaclotide has been shown to be extremely well tolerated at all tested doses (34), even with the highest dose of 3,000mcg per day. The side effects of Linaclotide were similar to those observed in the placebo group, with the exception of softer stools in the study group (treated with Linaclotide). As expected, no traces of the drug were detected in the plasma, since Linaclotide is not absorbed; remember that Linaclotide is a peptide. It is expected that diarrhea is relatively common during Linaclotide treatments; a prolonged effect of the use of the drug itself. Also, Linaclotide, like any medicine for constipation, is absolutely contraindicated in cases of intestinal obstruction, either suspected or radiologically confirmed. Linaclotide is the first drug to be used in the novel strategy, described above, for the treatment of both Chronic Idiopathic Constipation and Constipation Associated with Irritable Bowel Syndrome. 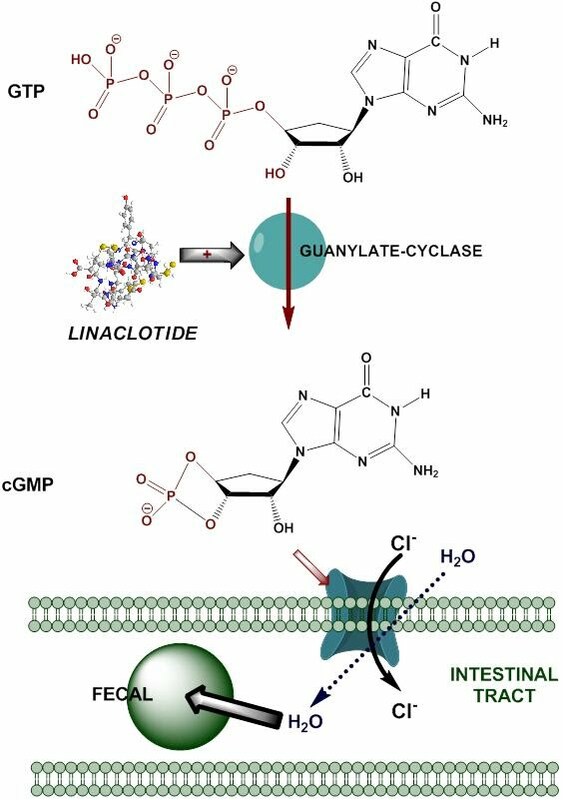 The mechanism underlying the pharmacological effect of Linaclotide involves activating the enzyme "guanylate cyclase", which is inserted in the apical membrane of the epithelial cells which line the colon, and whose activity leads to an increase in intracellular cGMP levels. This metabolite “opens" channels for chloride anion in the apical membrane of epithelial cells, increasing the concentration of this anion (together with bicarbonate) in the intestinal lumen. The increased presence of electrolytes draws water into the intestinal lumen, softening stools and facilitating their transit. The administration of Linaclotide per os increases intestinal secretion and accelerates the transit of stools (studies in rodents). The first studies in humans confirm the results obtained in experiments on animals. Irritable Bowel Syndrome and Chronic Idiopathic Constipation are the consequence of complex disorders which are linked to intestinal inflammatory illness that involves the “hypothalamic-pituitary-adrenal axis”. It is perhaps for this reason that the drugs to treat these multifactorial diseases have very limited clinical results. Linaclotide is a new drug that blocks a particularly transcendent biochemical mechanism which increases intestinal motility, and facilitates the movement of the stool. At present it is very difficult to predict whether this pharmacological approach will signify a substantial improvement compared to the armamentaria available today which is limited solely to Lubiprostone. With Lubiprostone systemic absorption is necessary, while Linaclotide is not absorbed, and is, therefore, extremely well tolerated. Lubiprostone (approved for Chronic Idiopathic Constipation, and in clinical trials for constipation associated with Irritable Bowel Syndrome) causes nausea, an effect that can be controlled by administering the drug at meal times. Nevertheless, there is insufficient information for a real estimation of the potential adverse effects of Linaclotide. The enzyme "guanylate cyclase" is a receptor for the heat-stable enterotoxins which cause acute diarrhea. This enzyme is also expressed in extra-intestinal tissues, such as the kidney, the respiratory epithelium, the perinatal liver, the stomach, the brain and the adrenal glands. Exogenous ligands binding to “guanylate-cyclase” lead to an accumulation of cGMP, activating protein-kinase, and the phosphorylation of CFTR (one of the channel activators of the trans-epithelial chloride anion) (35). Linaclotide has no effect on serotonin (5-HT [5-HydroxyTryptamine)]. Tegaserod (partial agonist of 5-HT4 subtype) was withdrawn from the Pharmaceutical Market, and this fact was a stimulus for the investigation of other potentially useful drugs. 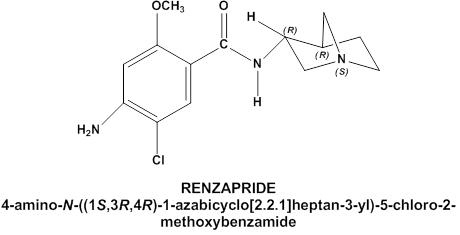 For example, Renzapride (a drug dual, 5-HT3 antagonist, and 5-HT4 agonist) has been studied (phase II clinical trial) for its potential usefulness in the treatment of constipation associated with Irritable Bowel Syndrome. It may become a rival to Linaclotide in the future. Tegaserod could be remarketed, or restricted to a program of "compassionate” use. Finally, on August 30, 2012, the U.S. FDA approved the first version of Linaclotide (Linzess®) from Ironwood Pharmaceuticals, including a specific mention of "chronic constipation associated with Irritable Bowel Syndrome in adults" (37). In the laboratory’s technical information it is emphasized that Linaclotide must be avoided by patients under the age of 16. Ironwood Pharmaceuticals will be marketing Linzess® along with Forest Laboratories. According to Wedbush Securities (financial analysts) Linzess® sales, in the U.S. alone, are expected to have a turnover of $40 million by 2013, and $165 million by 2014, reaching $2 billion by 2019. 1. Drossman DA, Camilleri M, Mayer EA, Whitehead WE. AGA technical review on irritable bowel syndrome. Gastroenterol 2002; 123(6): 2108-2131. 2. Higgins PD, Johanson JF. Epidemiology of constipation in North America: A systematic review. Am J Gastroenterol 2004; 99(4): 750-9. 3. Hasler WL, Schoenfeld P. Safety profile of tegaserod, a 5-HT4 receptor agonist, for the treatment of irritable bowel syndrome. Drug Safety 2004; 27: 619-31. 4. Quigley EM, et al. Safety and tolerability of tegaserod in patients with chronic constipation: pooled data from two phase III studies. Clin Gastroenterol Hepatol 2006; 4: 605-13. 5. George AM, et al. Clinical trial: renzapride therapy for constipation-predominant irritable bowel syndrome-multicentre, randomized, placebo-controlled, double-blind study in primary healthcare setting. Aliment Pharmacol Ther 2008; 27: 830-7. 6. Lembo AJ, et al. Clinical trial: renzapride treatment of women with irritable bowel syndrome and constipation – a double-blind, randomized, placebo-controlled, study. Aliment Pharmacol Ther 2010; 31: 979-9. 7. Mangel AW, Williams VS. Asimadoline in the treatment of irritable bowel syndrome. Expert Opin Investig Drugs 2010; Oct19 (10): 1257-64. 8. Mangel AW, Hicks GA. Asimadoline and its potential for the treatment of diarrhea-predominant irritable bowel syndrome: a review. Clin Exp Gastroenterol. 2012; 5: 1-10. 9. Barish CF, et al. Efficacy and safety of lubiprostone in patients with chronic constipation. Dig Dis Sci 2010; 55: 1090-7. 10. Carter NJ, Scott LJ. 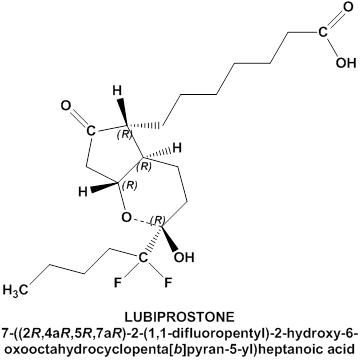 Lubiprostone: in constipation-predominant irritable bowel syndrome. Drugs 2009; 69: 1229-37. 11. Bradesi S, Tillisch K, Mayer E. Emerging drugs for irritable bowel syndrome. Expert Opin Emerging Drugs 2006; 11(2): 293-313. 12. Harris LA, Hansel S, DiBaise J, Crowell MD. Irritable bowel syndrome and chronic constipation: Emerging drugs, devices and surgical treatments. Curr Gastroenterol Rep 2006; 8(4): 282-290. 13. FDA Public Health Advisory: Tegaserod maleate (marketed as Zelnorm®). Internet site 2007, march 30. 14. Whitehead WE, Levy RL, von Korff M, Feld AD, Palsson OS, Turner M, Drossman DA. The usual medical care for irritable bowel syndrome. Aliment Pharmacol Ther 2004; 20(11-12): 1305-1315. 15. Schiller LR, Dennis E, Toth G. An Internet-based survey of the prevalence and symptom spectrum of chronic constipation. Am J Gastroenterol 2004; 99 Suppl S234 Abs 723. 16. Roy N, Guruprasad MR, Kondaiah P, Mann EA, Giannella RA, Visweswariah SS. Protein Kinase C regulates transcription of the human guanylate cyclase C gene. Eur J Biochem 2001; 268(7): 2160-2171. 17. Schulz S, López MJ, Kuhn M, Garbers DL. Disruption of the guanylyl cyclase-C gene leads to a paradoxical phenotype of viable but heat-stable enterotoxin-resistant mice. J Clin Invest 1997; 100(6): 1590-1595. 18. Microbia: Creating and developing innovative human medicines, a therapeutic agent in development for the treatment of IBS-C and chronic constipation. Microbia Inc COMPANY WORLD WIDE WEB SITE 2007 May 29. 19. Cordero E, Driggers E, Kessler M, Lai S, Norman T, Pierce C, Reza T, Tobin JV, Mahajan-Miklos S, Currie M. Activation of intestinal epithelial surface receptors as a novel approach for the treatment of c-IBS and chronic constipation. Gastroenterology 2004; 126(4) Suppl 2 Abs 746. 20. Bryant AP, Busby RW, Cordero EA, Tobin JV, Bartolini WP, Beaufrand C, Bueno L, Currie MG. MD-100, a therapeutic agent in development for the treatment of IBS-C, enhances intestinal secretion and transit, decreases visceral pain and is minimally absorbed in rats. Gastroenterology 2005; 128(4) Suppl. 2 A464. 21. Bueno L, Beaufrand C, Mahajan-Miklos S, Bryant AP, Currie MG. Antinociceptive actions of MD-1100, a novel therapeutic agent for c-IBS, in animal models of visceral pain. Am J Gastroenterol 2004; 99: 10 s283. 22. Microbia presents data on novel candidate with potential to treat irritable bowel syndrome. Microbia Inc PRESS RELEASE 2004 May 19. 23. Gotham S. Digestive Disease Week (Part IV), New Orleans, 15-20, May 2004. IDDB Meeting Report 2004 May 15-20. 24. Bryant AP, Cordero EA, Tobin JV, Rivers S, Kurtz CB, Currie MG. Linaclotide significantly improves post-operative ileus and opiate-induced constipation in rats. Gastroent 2006; 101(9) S486 A1257. 25. Busby RW, Bryant AP, Cordero EA, Kessler MM, Pierce CM, Tobin JV, Cohen MB, Currie MG. The molecular target of MD-1100 is guanylate cyclase (GC-C) an apical receptor on intestinal epitelial cell. Gastroenterology 2005 128(4) Suppl. 2 A464. 26. Gotham S. Digestive Disease Week (Part IV), New Orleans, 15-20, May 2004. IDDS Meeting Report 2004 Mayo 15-20. 27. Bryant AP, Busby RW, Cordero EA, Kessler MM, Pierce CM, Tobin JV, Fretzen A, Kurtz C, Currie MG. The characterization of an active metabolite of MD-1100, a therapeutic agent development for the treatment of IBS-C and chronic constipation. Gastroenterology 2006, 130(4) Suppl. 2 Abs T2034. 28. Microbia’s MD-1100 safe in phase Ia trial. Microbia Inc Press Release 2005 May 17. 29. Kelland L. EuroTIDES 2005 – Sixth Annual IBC Conference (Part I), Oligonucleotide, RNAi and peptides for the drug development and manufacturing industry, Munich, Germany. IDDB Meeting Report 2005 February 27. 30. Microbia presents results from phase 1 trial demonstrating MD-1100 is active and well-tolerated in healthy volunteers. Microbia Inc Press Release 2005 October 31. 31. Currie MG, Kurtz C, Mahajan-Miklos S, Busby RW, Fretzen A, Geis S. Effects of single dose administration of MD-1100 on safety, tolerability, exposure, and stool consistency in healthy subjects. Gastroenterol 2005; 100 9S328. 32. Linaclotide shown to improve symptoms of chronic constipation in phase 2A study. Microbia Inc Press Release 2006 October 24. 33. Andresen V, Busciglio I, Grudell A, Burton D, McKinzie S, Foxx-Orenstein A, Zinsmeister AR, Currie MG, Kurtz C, Camilleri M. Effects of a novel, first-in-class guanylate cyclase-C activator, linaclotide acetate (MD-1100), on gastrointestinal and colonic transit and bowel habits in patients with constipation-predominant irritable bowel syndrome (C-IBS). Dig Dis Week 2007 Abs 532. 34. Kurtz C, Fitch D, Busby RW, Fretzen A, Geis G, Currie MG. Effects of multidose administration of MD-1100 of safety, tolerability, exposure, and pharmacodynamics in healthy subjects. Gastroenterology 2006 130(4) Suppl. 2 Abs 132. 35. Zangh W, Mannan I, Schulz S, Parkinson SJ, Alekseev AE, Gómez LA, Terzic A, Waldman SA. Interruption of transmembrane signaling as a novel antisecretory strategy to treat enterotoxigenic diarrhea. Faseb J 1999; 13(8): 913-922. 36. Linaclotide: clinical trials. http://www.clinicaltrials.gov/ct2/results?term=Linaclotide&Search=Search. In: www.ClinicalTrials.gov [Consult: August 2013]. 37. López-Tricas, JM. Autorización de Linaclotide contra el estreñimiento crónico. http://www.info-farmacia.com/actualidad/desarrollo-y-conciencia-social/autorizacion-de-linaclotide-contra-el-estrenimiento. 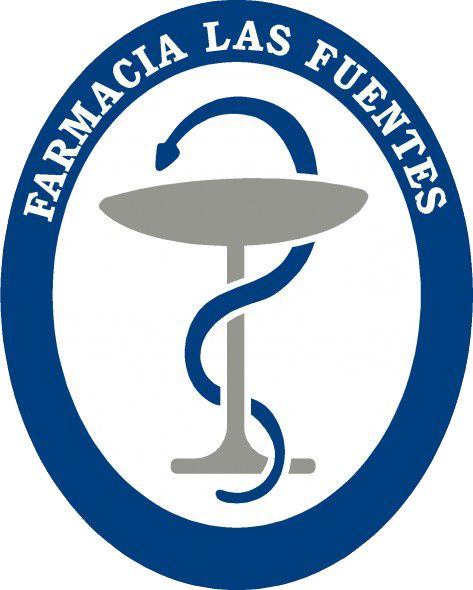 En www.info-farmacia.com [consult: August, 2013].